At an average length of around 10 feet, personal watercraft (PWC) may seem small, but they come with some pretty big responsibility. 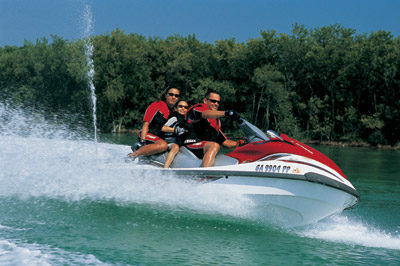 With the horsepower of a large outboard engine and the acceleration of a motorcycle. PWC are not toys. The U.S. Coast Guard considers personal watercraft Class A vessels, which means all safety equipment and operation laws that apply to boat under 16 feet also apply to a PWC. Most states have operator age and education requirements, too. So before you launch, here are a few things you’ll need to know to have a safe and hassle-free day on the water. A life jacket for each operating passenger, and person being towed. An approved sound-signaling device such as a whistle or horn. Proper display of registration numbers, letters and validation decals. Vessel registration, to be displayed when requested.A functioning backfire flame arrestor and passive ventilation system. Hand-held VHF radio, and a cell phone as a backup. A basic first-aid kit, sunscreen, and burn cream. A dewatering device such as a hand operated bilge pump. An anchor and enough anchor line for your area. If pulling a skier or other tow-sport participant, a skier-down flag, and a server over a certain age, and rear–view mirrors may also be required. Even if they’re not required, they’re good to have. It’s recommended on inland waters you have a suitable, daytime distress signal such as flares, an orange flag, or signal mirror.